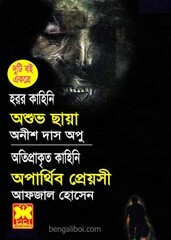 Two books of two authors are in a cover, 'Ashubho Chhaya' by Anish Das Apu and eight horror stories in the part, 'Aparthibo Preyoshi' by Afjal Hossain and seven supernatural stories in this part. Every story has grown around the familiar environment around us but actually stories are in another world. Every story will thrill you. The ebook pdf has 234 quality pages, 13mb file size.